It’s quite rare for any big fight to be staged on a Sunday; even rarer if the Sunday doesn’t fall on a bank holiday weekend. The big fights these days are reserved for Friday and Saturday nights, but it seems Tony Bellew and David Haye are on the verge of agreeing to a rematch of their March battle, to take place at London’s O2, on Sunday December 17th. While various publications have reported how the rematch is indeed “very close,” with the word now being how it all hinges on whether or not Bellew will indeed sign on for the return bout. Bellew has recently spoken of his other options – including a big fight with pound-for-pound king Andre Ward – but things seem to have gone quiet here. 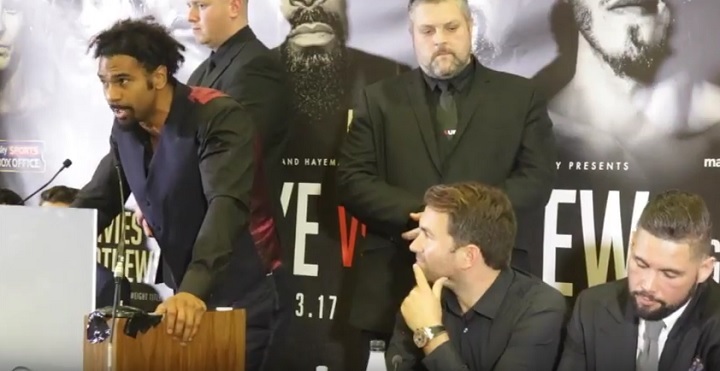 Haye wants revenge, and Belllew – who of course won in quite bizarre fashion, with Haye rupturing his Achilles early on in the bout that was finally stopped in round-eleven – wants to prove his big win was no fluke. If the return does happen it will add further to a great end of the year boxing schedule: what with Deontay Wilder-Luis Ortiz set for November and Vasyl Lomachenko-Guillermo Rigondeaux on for December 9, to list just two cracking match-ups we can look forward to before the end of 2017. It will also prove how successful the fight will be both at the live gate and on the expected platform of pay-per-view or box-office; will fans turn out in their droves on a dark and cold Sunday night so close to Christmas, having to work the following day? As for who wins the return, that really is a tough one. No-one really seemed to give former light-heavyweight champ Bellew much of a chance ahead of the first fight, but he may well enter a return bout as the betting favourite. We simply do not know how much Haye has left to offer, nor do we know how his Achilles injury may or may not affect him in any future fight. Interestingly, Bellew won his WBC cruiserweight title on a Sunday night, but again, this was during a bank holiday weekend in the UK.